Unless an event grabs your attention during Multiple Sclerosis Awareness Month in March, you may give little thought to multiple sclerosis (MS). But Kathleen Healey, PhD, APRN, thinks about this unpredictable disease all year long. In fact, Healey, assistant professor in the Department of Neurological Sciences at the University of Nebraska Medical Center, has made MS the focus of her career. To this end, in 2014 they started a house-call program to provide primary care to homebound people with MS. 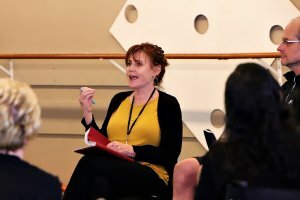 The program’s success showed Healey the participants’ keen desire to be less alone, and she realized she needed to go further. 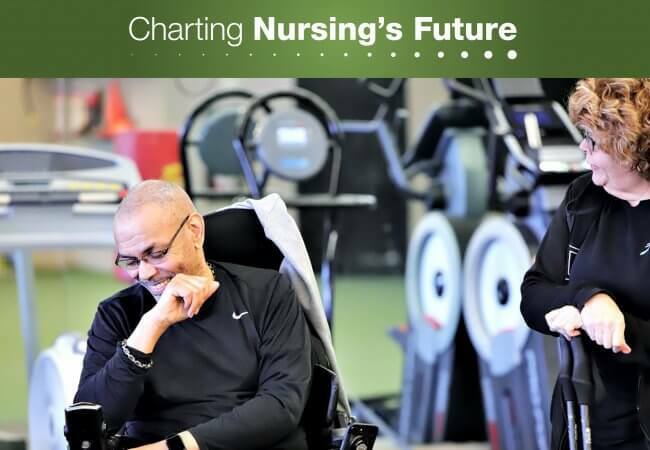 Nurse practitioner Kathleen Healey partnered with gym owner Daryl Kucera (at right) to create a day program that is improving the quality of life for people with MS. Photo credit: Monica Sempek Photography. She collaborated with a local gym owner who also happens to have MS, and the concept for a day program called EASE (exercise, advocacy, socialization, education) was born. 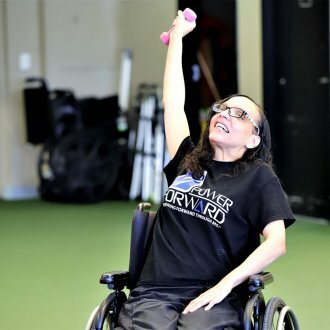 The Multiple Sclerosis Foundation agreed to fund a pilot, including transportation, program fees, and lunches, and in 2017, gym owner, Daryl Kucera, opened his facility to EASE participants five hours a day, twice a week for exercise classes, advocacy meetings, social events, and educational programming. An even more empowering element of EASE is the social aspect. Individuals with MS can experience a range of challenges, including muscle weakness and issues with coordination, vision, and bladder and bowel function. “These things combine to hinder mobility,” Healey says, “which in turn affects access to employment, housing, transportation, and health care,” and puts people at risk for social isolation. The EASE program combats these challenges by creating community. That rejuvenation is also reflected in the physical health of the “First Six,” those individuals from the house-call program chosen by Healey to participate in EASE. Their incidence of medical complications has dropped significantly since joining the program. Now the group, which has grown to the “Great Eight,” is reaching out. “They’re networking!” Healey reports, using videoconferencing to share their knowledge and experience with others who have MS. The program is so valued by the participants that they’ve used their advocacy training to secure funding from a local business to keep the EASE program going. MS Forward. The 501(C)(3) not-for-profit gym, whose owner also has MS, that partnered with Healey to provide a site for EASE. Multiple Sclerosis Foundation. Provided the grant that funded the first year of EASE. MS & Me YouTube video. Written by Kathleen Healey to raise awareness about the struggles faced by individuals with MS and significant disability.